Huge quantities of these items were dutifully placed in their tombs when they departed this life. Tutenkhamon (d. 1360 B.c. ), of archeological fame, but a rather minor Pharaoh, had a solid gold coffin weighing 2,400 pounds.3 The earliest use of gold as a monetary standard seems to have occurred among the Babylonians about 2000 B.C. ; perhaps even earlier. The basic monetary unit of the Babylonian Empire was the shekel, not a coin at this time but an ingot of gold weighing about 8.34 grams and considered to have a value equivalent to a healthy ox. The reliability and the practicality of the shekel were most significant factors in the renowned commercial abilities of the Babylonians in the ancient world. Nor were the early Greeks immune from the lure of gold—not even in their most heroic age. Stripped of its mythical disguise, the Homeric legend of the golden fleece is probably just an account of a Greek raid on Armenia about 1200 B.C., to steal the gold that was being produced there by an extensive river panning and washing operation. But for all their creative instincts, the Greeks, as well as the rest of the world, were at that time still five centuries away from the final evolution of gold into money. And when it came, it came not from the logical Greeks but from their neighbors, the Lydians. The Lydians were an intelligent and industrious people of mixed aboriginal and Aryan stock who occupied what is now south- The Color of Gold 47 central Turkey. The minor Lydian Empire has been described as the industrial power of the ancient world. Its glory, however, was historically brief and its final destiny was to be overrun by the great Persian Empire of Cyrus. But somewhere along the way, in addition to their spectacular creation of coined money, they also found time to establish the first commercial inns and to invent the game of dice. It was Gyges of Lydia who, around 700 B.C., established the first mint, in order to put the seal of his kingdom on uniform-sized lumps of natural gold—an alloy the Greeks called “electrum” (usually comprised of about 75 percent gold and 25 percent silver). Silver was coined on the island of Aegina soon afterwards. But it remained for another Lydian monarch, the legendary King Croesus (560-546 B.c. ), to strike the first coins of pure gold.' These first gold “coins” were little more than bean-shaped lumps of metal with the heads of a lion and bull facing each other, and a double square marking the reverse. But they began an evolution in the economic affairs of men that has yet to be completed. 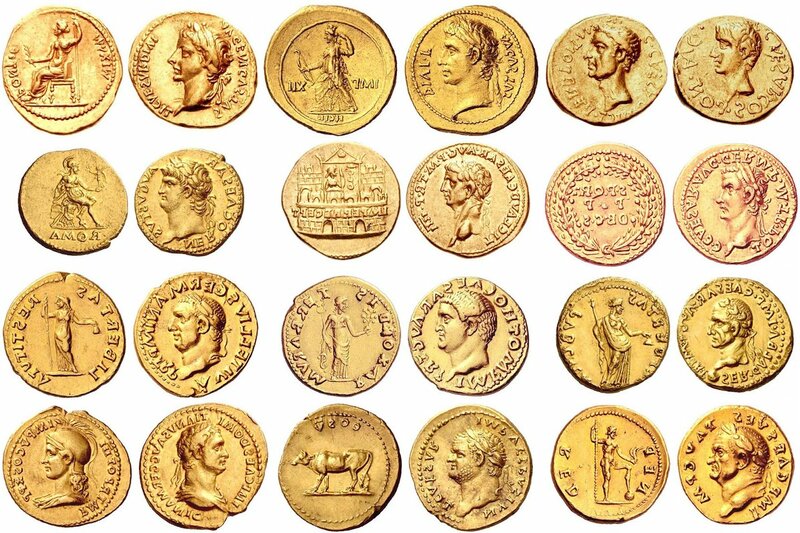 Gold coins have been minted by almost every government since that of the famed Croesus, whether permanent or provisional, secular or ecclesiastic, royalist or republican.' Consequently, im- mense quantities of gold coins have been struck in the 25 centuries since the invention of coinage. In the modern era, still more immense stocks of the yellow metal have been cast into ingots and retained as official monetary reserves, or as backing for paper money. Yet the desire for gold, the need to possess something of enduring value, has seldom been stronger than it is today. It is no mere historical accident that so many gold coins have survived from ancient times, or that the gold coins of modern history can be found so frequently in brilliant uncirculated condition.